Home > Hinduism > 16 Sanskar > Why are certain rituals performed before commencing any sanskar? Why are certain rituals performed before commencing any sanskar? The Vedic rituals performed by the parents and the teacher on the son or daughter from the time of conception till marriage so that they may perform balanced [sattvik (sattva predominant)] actions are referred to as the sanskars (rites). There are sixteen important sanskars. ‘A process of increasing the potential. The origin of the word sanskar is sam (सम्‌ ) + kru (कृ) + ghyan (घञ्‌) = sanskar (संस्‍कार). Thus the word sanskar is formed by prefixing the preposition sam denoting balance, to the verb kru and suffixing ghyan to it. It has manifold meanings such as to improve, to purify, to remove shortcomings in an object and to endow a new, attractive form to it. In short, the process by which positive qualities in man are developed and enhanced is known as a sanskar. Two or three days prior to performing the sanskars, the house should be painted. A picture of Lord Ganapati should be installed at the main door of the house. If there is a compound or courtyard in front of the house then a pandal should be erected, and after smearing the floor with cowdung, designs of auspicious symbols such as the svastik, lotus, etc. should be drawn using special powder of soft white stone (rangoli). Before the ceremony of the sanskar, the one on whom the sanskar is to be performed as well as the relatives should wear new clothes and ornaments. Relatives and well-wishers should present gifts to the one on whom the sanskar is being performed. A. ‘To prevent distressing energies from attacking the one on whom the sanskar (rite) is being performed, one should make an offering of an animal sacrifice (bali) and pay obeisance to them at the time of the ceremony. B. Some specific remedies: In the ceremony of Mundan (shaving off the child’s hair) the hair thus cut is hidden by mixing in a cake of cowdung and then buried in the cowshed or immersed in the river. This prevents the spirit of a diseased person (pishach) from possessing the child, using the hair as the medium. Sometimes to confuse these spirits an effigy of a sick person on his deathbed, is burnt. The motive behind this is to prevent them from attacking the subtle body of the man after he dies, with the belief that he has already been cremated. C. The third method is to attack and then criticize and abuse them. It is believed that spirits fear mustard seeds. Hence mustard seeds are strewn around the place where the sanskar is to be performed. D. Mantras like ‘Yadatrasanthitam bhutam…. (यदत्रसंस्‍थितं भूतं०)’, etc. are chanted, warning the spirits to vacate the place. E. Celibates (brahmacharis) and celibates who have returned from their Gurus’ homes (snataks) wield a staff for the same purpose. F. At times people selfishly direct the spirit troubling their relative on whom the sanskar is being performed onto someone else. G. The bridal costume is a favourite medium of attack for spirits. No spirit can trouble a Brahman (priest). Hence, that costume is either gifted to a Brahman or hung on a tree or in a cattle shed. * Since the importance of each supporting ritual is 1%, the sum total of the five is 5%. The reasons for using sandalwood paste (gandha), specific flowers, incense, copper, silverware, etc. are explained in ‘Science of Spirituality: Chapter 7 – Path of Devotion (Bhaktiyoga). A. The objectives: To prevent any obstacle from disrupting an auspicious occasion, it is begun with the worship of Lord Ganapati, a practice which is prevalent since the last century. 1. Bath: The host and hostess performing the religious ceremony should bathe and wear clean attire. 2. The seat: The floor should be wiped clean, smeared with fresh cowdung and two or three wooden seats (pats) should be placed on it. Woollen cloth should be spread out on these seats and the sides should be decorated with designs drawn with special powder of soft white stone (rangoli). The energy generated in the body during worship, instead of escaping into the ground instantly, is conserved in the body for atleast sometime due to the wooden platforms and woollen cloth. More information on seats (asans) is given in ‘Science of Spirituality: Chapter 3 – Practice of Spirituality’. 4. Application of sandalwood paste (gandhadharan): Married women (suvasinis) should apply a tilak of sandalwood paste (gandha) onto the foreheads of the host and hostess performing the religious ceremony, the one on whom the sanskar is being performed and the guests. The energy generated due to the ritual of worship (puja) which flows through the Adnya chakra of the one performing the worship is increased by 5% when sandalwood paste is used. It also obstructs the entry of distressing energy through the Adnya chakra to the extent of 5%. Of the pleasant or distressing energies entering the body 30% do so through the Adnya chakra. Married women represent manifest energy while unmarried girls represent unmanifest energy. The sandalwood paste applied by married women is more effective as due to the manifest energy in them it facilitates the increase of the sattva component in the one on whose forehead they apply the paste. On auspicious occasions widows do not apply tilak to others as the quantity of manifest energy in them has been reduced on account of their married life. 5. Sipping water from the palm (achaman): The host performing the religious ceremony should take a little water from the vessel for worship (panchapatri) with an offering spoon (pali) onto his palm and sip it. This is called achaman. Just as bathing causes external purification, partaking water in this way is responsible for internal purification. Often this act is repeated thrice. Thus physical, psychological and spiritual, internal purification is brought about. 6. Wearing the sacred ring (pavitra/pavitrak dharan): The host performing the religious ceremony should wear a sacred ring made of sacred grass (darbha). As a result, pure particles of spiritual energy (pavitrakas) in the atmosphere get attracted towards him in greater amounts. Pure particles of spiritual energy are the subtlemost particles of divine energy (chaitanyakas) of various deities. 8. Salutation to the benevolent deity (ishtadevata) and the family deity (kuladevata): One should offer obeisance to Them offering fruit and betel leaves with betelnut, lime, cardamoms, etc. Thus one obtains Their blessings too. 9. Sipping water from the palm (achaman): One should perform pranayam sipping water from the palm while chanting each Name out of the twenty-four Names of Lord Vishnu, commencing with Keshav. 1. Holding unbroken consecrated rice (akshata) and an offering spoon (pali) with water in the cup of one’s hand one should chant the mantra with the resolve, ‘I of the …..lineage (gotra), ….. Sharma (Sharma refers to the Brahman, Varma to the Kshatriya, Gupta to Vaishya class and Das to the Shudra class.) am performing the …. ritual to obtain the benefit according to the Shrutis, Smrutis and Purans in order to acquire …. result and then should offer the water from the hand into the circular, shelving metal dish (tamhan). Offering the water into the circular, shelving dish signifies the completion of an act. 2. Then taking water again and expressing the resolve, ‘I am hereby performing Punyahavachan, Matrukapujan, Nandishraddha, [the installation of the deity of the pandal (mandapdevata) and the family deity (kuladevata)]’ the water should then be offered into the circular, shelving metal dish. 3. Once again water should be poured into the cupped hand and expressing the resolve, ‘I am worshipping Lord Ganapati so that the ceremony is completed without any obstacle’, the water should be released into the circular, shelving metal dish. 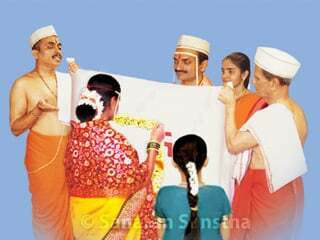 In any religious ritual the resolve (sankalpa) made plays a role in acquiring the benefit from the ritual. 1. Installation of the idol: A betelnut washed with water should be placed on a small heap of rice. (In Goa instead of betelnut a coconut is used.) This is similar to the installation of the idol of Lord Ganapati which is done on rice, heapedup on a wooden seat (pat) during the festival of Ganesh Chaturthi. In a religious ritual, rice refers to consecrated, unbroken rice grains (akshata). Rice grains have the ability to attract very distant pure particles of spiritual energy (pavitrakas). Betelnut too possesses the potential of attracting them from both male and female deities. This potential is activated by a mantra. 2. The mantra to invoke Lord Ganapati: After saying, ‘Gananam tva Ganapatim havamahe….. (गणानां त्‍वा गणपतिं हवामहे०)’ one should say ‘ॐ भूर्भुव: स्‍व: ऋद्धिबुद्धिसहितं सांगं सपरिवारं सायुधं सशक्‍तिकं महागणपतिमावाहयामि ।’ meaning ‘O great Ganapati come along with Ruddhi, intellect, Your entire family, all Your weapons and might’. Then consecrated rice should be offered to invoke Lord Ganapati on the betelnut. In between ‘Om Bhurbhuvaha svaha (ॐ भूर्भुव: स्‍व:)’ is chanted like the three step (tripad) Gayatri mantra. To prevent an obstacle of any sort in the ritual, Lord Ganapati is invoked (avahan) with all His weapons and might. 4. Offering of flowers (pushpanjali): Finally chanting, ‘(अनया पूजया सकलविघ्‍नहर्ता महागणपति: प्रीयताम्‌ ।)’ meaning, ‘May Shri Mahaganapati, the vanquisher of all obstacles be appeased with this worship of mine’, water should be released. This completes the ritual. For details about Ganapati refer ‘Science of Spirituality : Chapter 19 – Ganapati’. B. The importance: Due to their utterance that day acquires energy. 2. Five foliages – branches of mango, fig (umbar), the holy fig tree (pimpal), jamun and banyan trees. 3. Nectar of five ingredients (panchamrut) – a mixture of milk, curds, clarified butter (ghee), honey and sugar. 4. Five gems – gold, silver, diamond, pearl (rajavarta) and coral. D. Preparation: The wife should sit to the right of the host and the one on whom the sanskar (rite) is to be performed should be seated to her right. The aim behind sitting to the right of her husband is to generate more energy during the ritual. The right side corresponds to the Surya nadi (Sun channel). E. The resolve (sankalpa): After uttering the name of the place and the time one declares the resolve by saying ‘कार्यांतर्गतं पुण्‍याहवाचनं करिष्‍ये ।’ which means ‘I am performing Punyahavachan for …. sanskar’. F. Touching the earth (bhumisparshan): Chanting the mantra, first the earth (ground) on the right hand side (since the host performing the religious ceremony is facing the east, the hand touching the ground is in the southern direction) and then the earth on the left hand side, in front of oneself (that is the northern direction) should be touched. Energies from the south are distressing. To prevent them from causing distress, one offers obeisance to them by touching the earth. The energies from the north are however saluted as they are pleasant. 1. Holy water (tirthodak): Clean water either from rivers like the Ganga or elsewhere should be filled in both the pots. They should then be worshipped with sandalwood paste (gandha), a sacred grass (durva), five foliages, fruits such as the coconut, five gems, offering of money (dakshina) and the ritual of tying of a thread (sutraveshtan). A pot filled with water represents a fulfilled life. 2. The water vessels (purnapatra): One betelnut should be placed in each of the two vessels filled with rice. These vessels should be placed over the two pots as their lids. 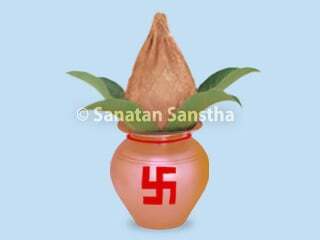 One of the pots symbolises the right side of Lord Varun and the other the left. After saying, ‘कलशे वरूणं सांगं सपरिवारं सायुधं सशक्‍तिकं आवाहयामि ।’ which means ‘The deity of rain Varun, please come along with Your entire family, all Your weapons and might’, consecrated rice (akshata) should be sprinkled on the betelnut. Then Lord Varun should be worshipped with five substances namely sandalwood paste, consecrated rice, flowers, incense and a lit lamp. Prayer made to the pot: Lord Vishnu is at the mouth, Lord Rudra at the neck and Lord Brahma at the bottom of the pot. In the middle are the assistants of the Matruka deities, etc. Then consecrated unbroken rice should be put in the pot facing the north. After paying obeisance to everyone (‘मातापितृभ्‍यां नम: । इष्‍ट देवताभ्‍यो नम: । …….. सर्वेभ्‍यो देवेभ्‍यो नमो नम: ।’ that is obeisance to the mother deity, father deity, the benevolent deity and all other deities) one should sit with knees touching the ground. Then cupping the hands in the shape of a lotus, one should carry the pot facing the north and touch it to one’s forehead, that of one’s wife and that of the priest, thrice. This is obeisance offered to the pot so as to be able to absorb the energy generated in it. Then the priest should say ‘May this day be an auspicious one’. Chanting the Niranjan mantra, married women (suvasinis) wave a lit lamp in a circular motion in front of the host and hostess of the religious ceremony and the one on whom the sanskar (rite) is being performed. Then lifting the right pot with the right hand and the left pot with the left the water from it should be poured into a vessel in a continuous stream. (Variation : The right hand should be used to lift the pot on the left and the opposite hand for the pot on the right.) Then the hostess should sit to the left of her husband and the priest should stand facing the north and should sprinkle water (abhishek) on the host and hostess of the ceremony and the one on whom the sanskar is being performed with five types of foliages and a sacred grass (durva), amidst chanting of mantras. Consequently, the energy generated in the pot is transmitted to all. Finally the host should sip water from the palm twice (achaman). This marks the end of the ritual. 2. Since the worship of the Matruka deities (Matrukapujan) is a part of the ritual of Nandishraddha, it is performed along with the latter. B. The ritual of worship (puja): Twenty-seven small heaps of rice should be made and a betelnut should be placed on top of each one of them. Ritualistic worship is performed as usual and then water is released to mark the end of the ritual. A. The objectives: The Nandishraddha is performed as an offering to the ancestors and their deities (Nandimukh and others) just as Lord Ganesh is worshipped before commencing any auspicious ceremony to ward off any obstacle. B. Preparations: In Nandishraddha (Vruddhishraddha) instead of one sacred grass (darbha), another (durva) is used. However, if the shraddha is a part of the rite of a sacrificial fire (yadnya) then grass without roots or a combination of both the sacred grasses (durva and darbha) is used. Substances which have the ability to attract pure particles of spiritual energy (pavitrakas) of a deity are used in the ritualistic worship (puja) of that particular deity. C. The ritual: The worship is performed with five substances namely sandalwood paste (gandha), consecrated rice (akshata), flowers, incense and a lit lamp and then some money (dakshina) is offered in a circular, shelving metal dish (tamhan). One copper coin (paisa) is thrown towards the south as an offering to the ancestors in the region of ancestors (pitrulok) situated in the south and to the distressing energies from that direction so that they do not cause trouble. Another copper coin is thrown towards the north as an offering to benevolent deities. A. 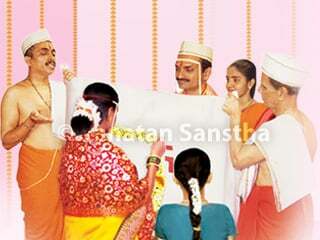 The objectives: Accepting the priest (purohit) in order to perform any ritual. B. The ingredients required: White mustard seeds, a mixture of milk, curd, butter, urine and dung of cow (panchagavya) and a betelnut. C. The ritual: The betelnut is offered to the priest after the chanting of a mantra and he is requested to be the officiating priest. The priest then saying ‘yes’ accepts the proposal. D. Sprinkling the ingredients with holy water (prokshan): The ingredients required for the ritual and the place where the ritual is to be performed is sprinkled with a mixture of the five substances mentioned above (panchagavya) using sacred grass (durva or darbha). Also, to prevent spirits from causing any trouble mustard seeds are scattered in all four directions. ‘Sixteen Sanskars and some other rituals’, published by Sanatan Sanstha. Why is Kanyadan performed after garlanding of bride and groom? Why is the earthen pot used in all important sanskars? What is the purpose of doing Oukshan? Why is Gaurihar puja performed prior to the marriage? Which factors are considered while arranging marriage? Spiritual intellect or subtlest state of intellect. Betel leaves with betelnut, lime, cardamoms etc. Compilation of traditions in Hindu Dharma. The period when the famous Hindu scriptures, the Vēdās were documented. A five-petalled metal lamp-dish with an attached conical stand to be set before an Idol. Destroyer form of Shrī Durgā, who killed the demons Chanḍa and Munḍa. Birth of Shrī Gaṇēsh according to the Hindu lunar almanac on Bhādrapad Shukla Chaturthī, that is, the fourth day of the bright fortnight of Bhādrapad. Bestower of knowledge, 2. The Deity that wards off all obstacles and one who is able to transform the nādabhāshā (Language of sound and spoken by human beings) into prakāshabhāshā (Language of light and spoken by Deities) and vice versa. Unbroken rice grains, usually smeared with kumkum and used in ritualistic worship.